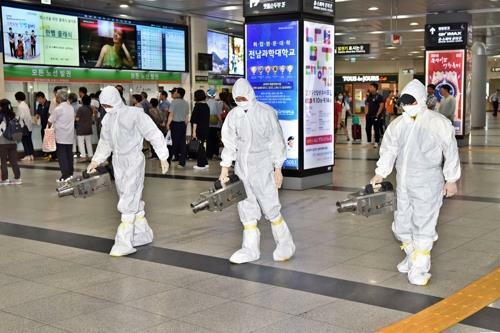 SEOUL, Sept. 12 (Yonhap) — All 10 people who had shown symptoms of the Middle East Respiratory Syndrome (MERS) tested negative for the disease, health authorities said Wednesday. The Korea Centers for Disease Control and Prevention (KCDC) said one person who came into close contact with a MERS patient, as well as another nine people who came into ordinary contact with him, and who had been placed under quarantine have all been released as they did not have the potentially life-threatening disease. Experts point out that the possible spread is mostly likely to have been contained as the incubation period for MERS has passed. The median incubation period for secondary cases associated with limited human-to-human transmission of MERS is approximately five days. The released people, however, will further be monitored by the KCDC as the longest incubation period reported is 14 days, officials said. On Saturday, a 61-year-old man was diagnosed with the disease after returning home from his visit to Kuwait. He was rushed to the emergency room of Samsung Medical Center in southern Seoul upon his arrival at Incheon International Airport. As of 6:00 p.m. Tuesday, a total of 21 people who had come in close contact with the MERS patient, including those on the plane, such as flight attendants, passengers, medical staff and immigration officials, have all been quarantined in their respective homes and are being monitored for signs of MERS. The agency said that 435 people who came into ordinary contact with the MERS patient are currently being monitored. They have not been quarantined, but they have to report their health conditions every day to officials in charge of monitoring. Among those who need to be checked are 10 foreign nationals who were on the same plane as the MERS patient. The KCDC said their whereabouts are not known at present and efforts are being made to find them. Meanwhile, 17 South Korean nationals who stayed in Kuwait and had contacted the patient all tested negative, Seoul’s foreign ministry said, citing the test results carried out by the Middle East nation’s health authorities. The ministry also noted that some 20 others now await a test in a hospital there, with none of them showing any symptoms of the disease.